Award winning author Gary Phillips put his own mark on the Private Eye genre with his creation of Nate Hollis. Originally a comic character, Nate made the transition to prose and to Pro Se Productions in HOLLIS, P.I. Hollis returns in a brand new collection set to debut December 13. GARY PHILLIPS’ HOLLIS FOR HIRE is now available for pre order in digital format. 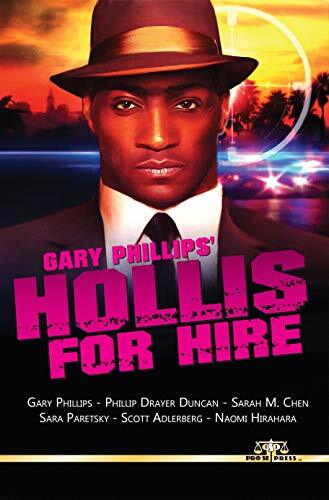 GARY PHILLIPS’ HOLLIS FOR HIRE, featuring a great cover by Jeffrey Hayes and digital formatting by Antonino Lo Iacono and Marzia Marina, is available for pre order in ebook format for $2.99 at https://www.amazon.com/Gary-Phillips-Hollis-Hire-ebook/dp/B07L2HQCVW/ref=sr_1_1?ie=UTF8&qid=1543971249&sr=8-1&keywords=hollis+for+hire. Both the print and digital copies will be available on December 13th, 2018 via Amazon and the Pro Se store at www.prose-press.com.